This is it. The one everyone in the family agrees is THE cookie. The one we just couldn’t imagine the holidays without. More delicate than shortbread, scented with vanilla sugar, to be made only with finely ground walnuts (no imposter almonds!) Take a bite and the cookie cascades like a buttery waterfall of sugary crumbs that melt in your mouth, with an elegant finish of earthy walnut. 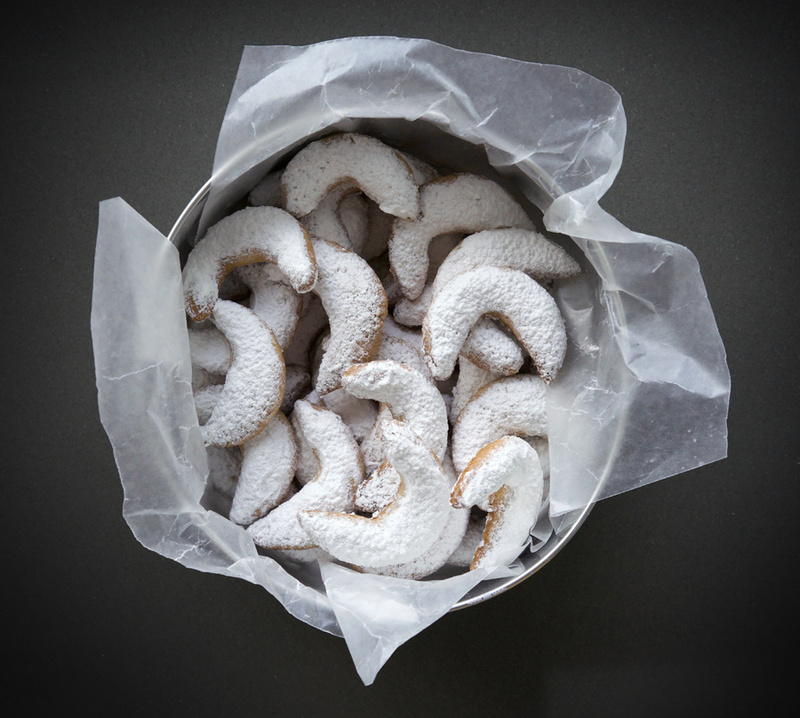 These are Grandma’s Vanilla Kipferl (Vanillekipferl), and this is the recipe her family has made for generations. I remember when Grandma shared the recipe with me. She told me a special grinder was needed for the walnuts, to get them fine enough. And that she mixed everything right on the countertop. (No bowls: mind=blown!) She taught me how the residual amount of butter on the foil wrappers they come in is usually just enough to grease the cookie sheets if you rub the wrapper directly onto the sheet. Her recipe was completely in metric, and she had what I thought was the most unusual dry measuring tool. It was shaped like a funnel with ingredients like flour, sugar, etc outlined in German on the inside along the top, and the corresponding units in grams below each ingredient (as 100 g of flour would sit at a different height in the funnel than 100 g of sugar). No mixing tools were used at all, she just used her hands to form the dough. I was determined to learn how to make these cookies, so I went home loaded with notes and worked on sorting it all out into something I could make with the tools I had. For starters, the walnuts. While she highly preferred using a specialized hand-grinder, I didn’t have this so I tried out my mini-food processor to grind the nuts instead. I have done this ever since and with a good quality, sharp blade you can get the nuts quite fine. No one has ever complained about the texture when eating my cookies, so I think it is just fine this way. Though if you have a German hand grinder, it would certainly make for a lovely, fine texture for your cookies. Below you can see a close-up photo of the grind texture obtained using a mini-processor. You also need to take care not to over-process, after which you will turn the nuts into nut butter instead of ground nuts! Next, how to mix the dough. I have to admit I felt a bit uneasy diving in using my hands in the early stages of the dough with so much butter. I also preferred the comfort of using a mixing bowl. My instincts told me to treat this a bit like pastry—after all the cookie is almost somewhere between a cookie and a pastry itself with its delicate texture, and it does start with cold butter. So I modified the technique to combine the butter into the dry ingredients using a pastry cutter to get it roughly incorporated before moving on to using my hands to knead it together. This keeps the butter from getting too warm, and yields a great texture in the end product. (If you don’t have a pastry cutter, you could also use two knives for this step.) 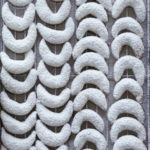 Below is a close-up shot showing the desired texture you want to achieve using the pastry cutter. Now, roll up your sleeves, remove any rings, and get in there with your hands! 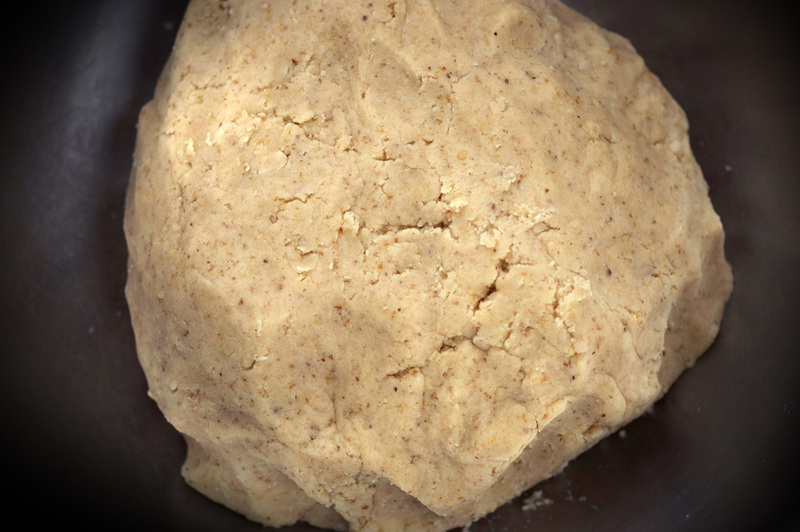 Squeeze, press and shape the dough until it comes together and forms a solid mass or ball. Grandma’s recipe says to add a little bit of milk if it’s not holding together, but generally I find I don’t need any, there is a lot of butter and the walnuts have some natural oils, too. Grandma was able to roll out the kipferls with such deft efficiency, I felt utterly useless with my pathetic looking little crescents at first (that took me three times as long to make). But don’t give up, it just takes practice. After all, she had probably hand-rolled literally thousands of these cookies by the time she was teaching me the ropes. One tip I learned from practice: don’t roll out too much dough at once, it will just fall apart. Also, you need to get the pressure just right—press too light while rolling and the roll will crumble from the centre. Press too hard and you’ll crush it. I found an even rolling style, using my palms rather than my fingers (finger impressions leave the roll dented and uneven), and gently coaxing the roll to grow out to the sides while pressing down works best. Starting with a small handful of dough (about the size of a large egg) roll it between your hands to get it started into a long roll. Then move it to the counter and roll it out until it is about 1/2″ inch in diameter. Next, cut the roll into 1″ pieces, and roll those out a bit more, turning the ends into the crescent shape and pinching the ends into points. It is important to remember that these cookies puff out and grow, so make them smaller than what you desire for the final cookie. I find it is really important for the aesthetic of the cookie to pinch the ends into points, otherwise they puff out and the ends lose their shape. For comparison, check out the raw cookie dough on the baking sheet shown immediately below, and the baked cookies, further down, to see the difference in size. A note about baking: during the final 3-5 minutes, you need to watch them like a hawk as they will go from perfect golden brown to dark with a bitter taste in a matter of 30 seconds—this is in large part due to the walnuts that burn easily. Even Grandma used to end up with a batch here and there that she would complain were overdone 🙂 When they display a nice even golden hue overall, they are ready to come out of the oven. It is also important to note how fragile Vanilla Kipferl are. When you take them out of the oven, do not try to move them for at least five minutes, or you will be sure to break them. They need a bit of time to set as they cool. For the sugar coating, Grandma always used packaged vanilla sugar mixed with icing sugar. If you can’t find packaged Vanilla Sugar, you can make it yourself by mixing a cut open, scraped out vanilla bean (along with the vanilla seeds) with icing sugar, ideally letting the bean sit in the sugar overnight to maximize the flavour transfer. I find Vanilla Kipferl are far too delicate to be tossed in sugar. Instead it is much easier and more efficient to sift the powdered sugar over top. I also like to ensure the bottoms of the cookies get their sugary coating, so I developed the method shown below, where you set out two cookie sheets and the final storage tin lined with wax paper. Place your cooling rack with cookies onto the first tray, then dust both that and the empty tray with vanilla sugar. Then move the cookies onto the dusted empty tray to coat the bottoms, before moving them into the paper lined tin. A quick note about storage: Grandma always said these cookies need to breathe, they do best in a tin lined with paper, and never seal the lid on tight—always leave a small air gap. The cookies last for weeks, in fact I think they get better with a bit of age. I feel honoured to be able to carry on the family tradition of making Vanilla Kipferl, following in the footsteps of so many generations before me. I always remember Grandma when making them—mine will never be quite as good as hers, but I think she would be pleased to know we still carry on her tradition every year. 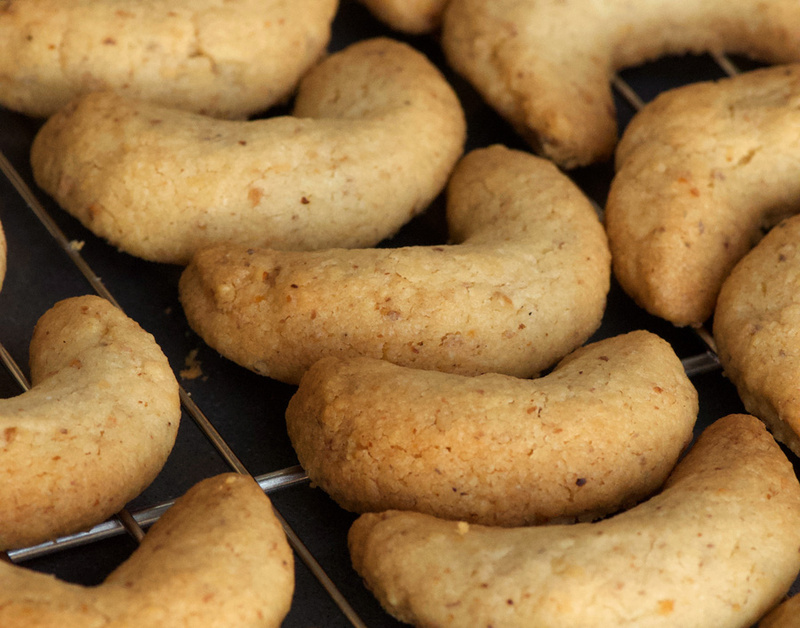 I hope you will try them out too, and maybe add a new cookie tradition to your holidays! More delicate than shortbread, Vanillekipferl melt in your mouth with a rich shattering of buttery, sugary crumbs lightly scented with vanilla. Prepare 2–3 baking sheets by lightly coating them with butter (Residual on the foil butter wrappers is usually the perfect amount and you can just rub the wrappers face-down onto the cookie sheets). Preheat the oven to 375°. Grind walnuts as fine as possible using a food processor, stopping when it starts to form solid clumps, to avoid over-processing it into nut butter. Add to a large bowl with flour and sugar and stir to combine. Cut cold butter into small pieces and add to the dry ingredients. 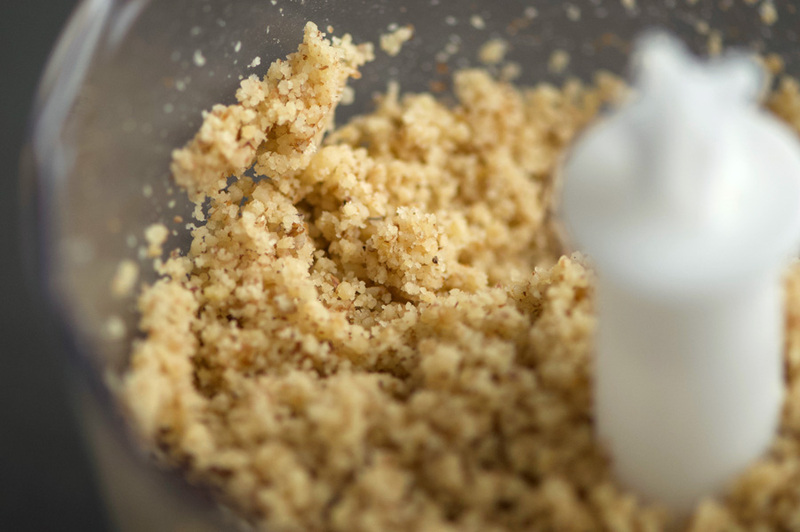 Using a pastry cutter (or 2 knives) cut butter into the flour mixture until it forms an even small crumb. (Refer to photo in story for a visual reference.) 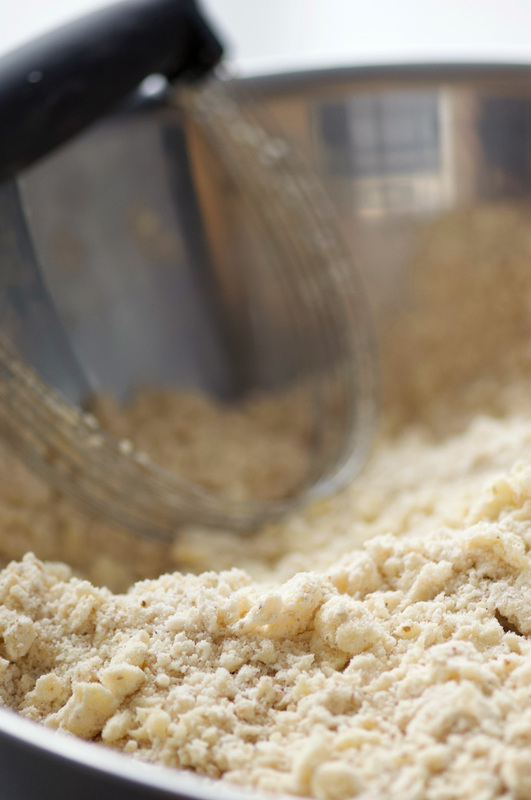 Use your hands to completely combine the butter into the flour, kneading until the dough forms a smooth ball. Only if needed, add a small amount of milk to help the dough hold together. 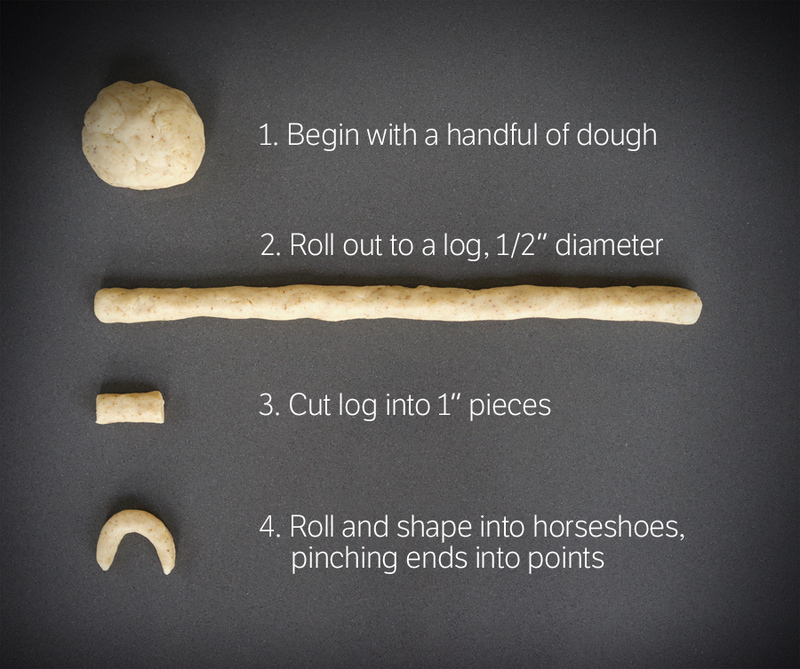 Take a small handful of dough and gently roll with light pressure into a log about 1/2" in diameter. Cut roll into 1" pieces. 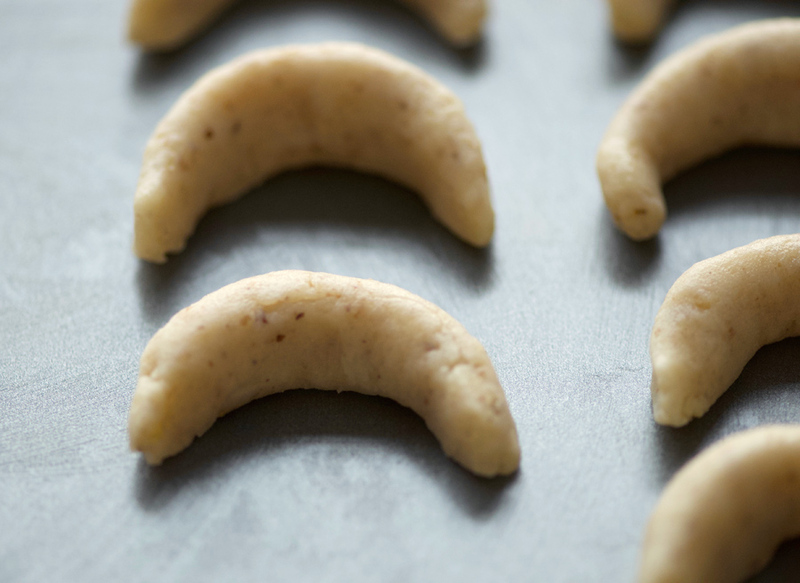 Take each piece and gently roll into the final cookie length, curving into a crescent shape and pinching the ends to taper them. Keep in mind they will puff and grow larger in the oven, so make them a little smaller than your desired final cookie size. Place on prepared baking sheet. Bake in preheated oven for 15–18 minutes. Rotate the cookies half-way through baking to ensure evenly browned cookies. Check carefully starting at 15 minutes to ensure they don't get too dark—the walnuts are delicate and will go from perfectly golden to burnt in a matter of 30 seconds if you step away! Remove from the oven when the cookies have an even light golden tone. Resist the urge to move the cookies off the sheet, as they are very fragile and will break while too warm. Allow to rest for 5 minutes before moving the cookies to a cooking rack. Allow to cool completely on the rack before coating with vanilla sugar in the next step. Mix icing sugar and vanilla sugar in a small bowl, have a small sifter ready. Set out two cookies sheets that fit your cooking rack, and have a metal tin lined with wax or parchment paper ready. Place one cooling rack with cookies into the first cookie sheet. Dust with sugar using the sifter, and also dust the empty cookie sheet beside it. 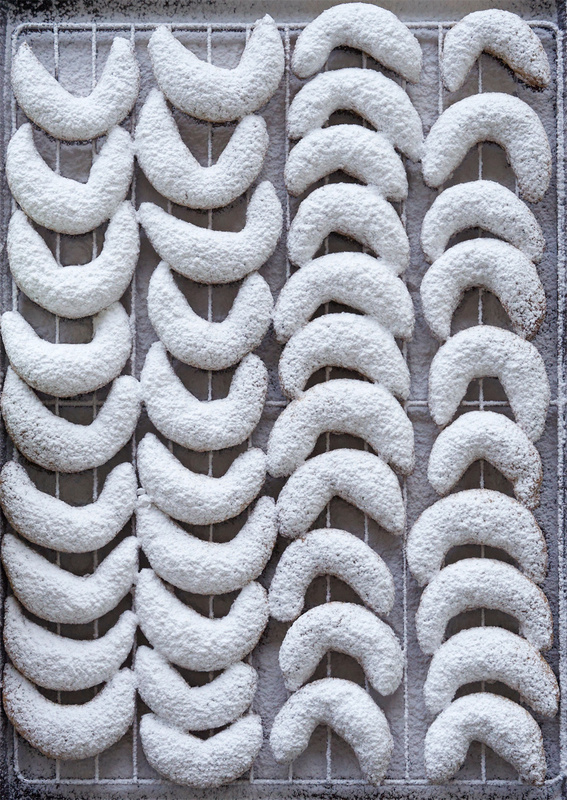 Next, transfer the sugar dusted cookies from the cooling rack to the empty cookie tray you just coated with icing sugar—this is to coat the bottoms of the cookies. Finally transfer the finished cookies into the prepared cookie tin.